I'm back! Just like Christa, I feel like I've been out of touch for ages...hmm, is that healthy? My last entry was only a few days ago! To be fair, though, I've been distracted by some pretty awesome things. 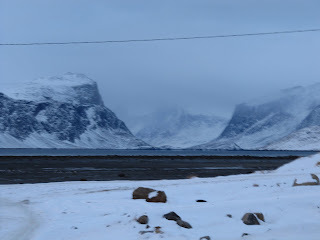 First off...I'm still trying to get a picture posted here that will convey the amount of snow that's hanging around; this is just a snap I took walking home from the Northern - the Pangnirtung Fjord narrowing into Weasel River. Isn't that the best name? 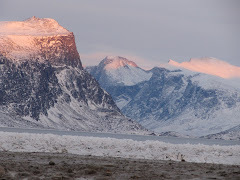 Auyuittuq National Park starts with something called the Overlord that - surprise - lords over the Weasel River which runs to Windy Lake and on to Mount Thor. I'm not a climber, but someday I'll make it out to at least see it. Before such a trek, though, another wonder of human habitation. The hamlet of Pangnirtung has been having some real problems with Duval River...the one I cross everyday. With the annual spring break-up it's regularly been wreaking havoc on the bridge; actually, I should say 'bridges'. Washouts. Go figure. Anyway, the current crossing ends with a crazy hairpin turn that, in the snow and ice of winter, must be a nightmare. Right now a new road is under construction; now, despite the number of culverts they've actually covered up, I really hope they finish with their playing around sometime soon. There's just something wrong with that last picture...which thing doesn't belong? You guessed it. Another reason I've been shirking my blogging mental exercises is the fact that, of course, my friend has been here for the past week. Instead, I've been splurging in my 'eating exercises'...I'm going to balloon if I eat like this everytime I have a visitor! And I like visitors. 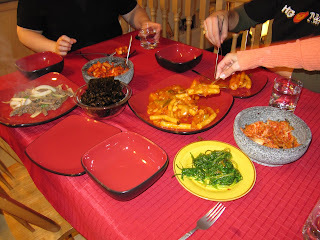 Friday a few friends - Newbie included - got together for some awesome Korean food. Not only that, but I have left-over ingredients to create my own tasty dishes after he leaves! 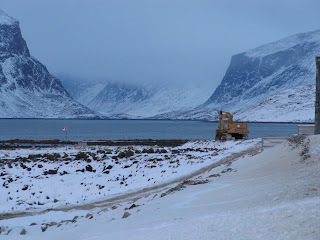 One more last piece of news (for this entry anyway)...special day here in Pangnirtung. The Vote. Will legal alcohol be available in Pang in the near future? The best thing I can see coming from this is that education and counselling will finally be available. The way things stand now, this type of help is not possible: 'If it's illegal, why should we provide counselling? There shouldn't be any issue in this regard.' That's the reasoning. Ha! Back to the grindstone for me...just a brief lunch update. I would kill for some Korean food. It's been years since I've had a good meal of it. I'm jealous. Gotta love that reasoning. I'm sure NOBODY drinks in Pang right?? Talk about putting your head in the sand. I for one hope they pass the vote since we'll be moving to Pang next year. It would be nice to have a drink every once and a while.